Annan Athletic kicked off their season in this years League 1-Division one this month. The team who enjoyed a successful season last year when they went all season undefeated faced a sterner test this time around when they met at Foresters at the beginning of the month. The team were unable to fulfil all their fixtures due to the bad weather but of the three fixtures played they won one and lost two, with all games being close knit affairs with them all ending 1-0. This seasons fixtures have now been announced for the new season and the league now has a new sponsor in Cashback for Communities. Last month Annan’s footballers were crowned League Champions in their first season in competitive football. 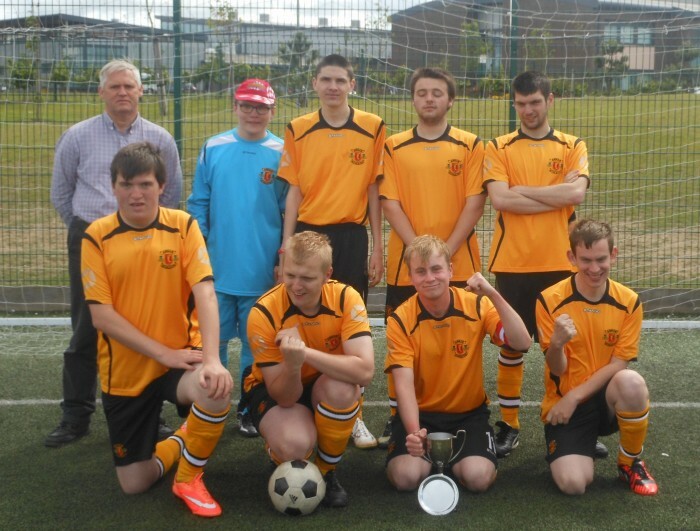 The Annan disability side won the PAN disability League One title after remaining undefeated through the whole season. The team were competing in the national competition after the Scottish FA were successful in a funding bid from the Scottish Government. This funding allowed them to create a PAN Disability League for the foreseeable future which started in August 2014. The league gives adults both male and female as well as youths the opportunity to compete in competitive 7 a-side matches over the course of a 5 league day, as well as a banding competition. George Morrison chair of Annandale & Eskdale Disability Sport and team coach said “I would like to congratulate the footballers on all their hard work, commitment and dedication throughout the season. I am very proud of them all and look forward to working with Annan Athletic next season to develop disability football in the area”.